The Graveyard Rabbit: Meet: "The Graveyard Rabbit of Lancaster County"
I haven’t always been Lancaster’s Graveyard Rabbit ~ I used to be a graveyard bunny wherever I could find a graveyard! You see, I find the history of my family and the country, in general, fascinating, and what better place to find it but in a Cemetery? Since I felt I had to “regionalize” my self for this group, I picked the County I live in, and it’s Cemeteries are so historic, volumes could be written on them. One of my addictions would be collecting books. My collection of books pertaining to Cemeteries is growing and, of course, invaluable to my Graveyard Rabbit blogging. I have over three bookcases of books pertaining to my genealogy passion, including area histories, family histories, research methodology, dictionaries, atlases, biographies and anything else that I think pertains to my passion! I find them in thrift stores, at garage sales, used book sales, online and just anywhere else they seem to pop up. My husband says I don't have enough days left on this earth to read all the books I have. My theory is if I get just a little out of each one, it's money well spent. I was born and raised in Hawaii and Guam, as many already know, and my parents finally brought us “Stateside” when I was in the 8th grade. We settled in Riverside, California where I lived off and on until the mid 80’s when my husband received a promotion to Tehachapi, ever heard of it?, California. My husband took an early retirement and it was off to Pennsylvania! We have looked back only because our entire family still lives there! I go back several times a year for my "grandkid fix!" 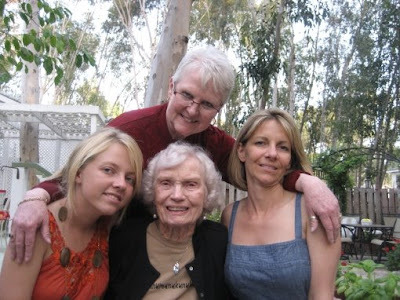 In fact when you read this, I will be in California helping my mother (age 89) pack up for her move into a retirement community.
. . . and I'm sure you want to know about my grandkids! Jim and I had 4 children between us. Jim's sons Scott and Tim were raised by his previous wife in Seattle and Jim and I raised my two, Blaine and Paige, in the Riverside area. Scott has three children, Donald, 22, Lauren, 18 and Stephen 18. Tim who died in the service, had a daughter Jacqualyn who is now 24 and she has a brother by her mother's second marriage, Zachary who is 18. We consider Zachary a grandson, too! Blaine is my oldest child and an Air Traffic Controller in Ontario, CA. He has our youngest grandson (a real surprise to them!) and Ellis is almost 4 years old. Paige is an Office Manager for an Optometrist and has two, Michael, almost 21 and serving in the USCG in Alameda and Hallie, 18, studying to be a nurse. We love our families and are proud of each and every one of them! My genealogy passion started in 1980 when my father died. I inherited a box of family photos, scrapbooks, newspaper clippings, family papers and artifacts. Among them was "Susannah's Bible" and you can read about it on my blog. This piqued my curiosity and I was off and running with my new interest. My interest has turned into my passion and as of this year I have over 9K documented people in my database. This, of course, includes allied lines, because, after all, they provide clues! I volunteer for RAOGK and have for years! I also volunteer for Find-A-Grave and the local Historical Society. I am a life member of one Historical Society, and a member of four others. I could belong to the DAR on four different lines, but haven’t taken the time to do so. I love researching, reading and exploring cemeteries. There is not enough time in the day to do everything I want to do! We are a team, Jim and I, in my Graveyard pursuits. What annoys me the most is he usually finds the headstone I am looking for! He helps find them, clean them up, set them up in their right place and photograph them. He swears there is not a Cemetery in mid-state Pennsylvania that we have not stopped in or I have not commented that “I have people there!” We have been known to take road trips just to see another cemetery. We both love the tranquility, history and beautiful crypts, headstones and monuments that are in Pennsylvania’s Cemeteries. Our latest road trip took us an hour away to see the old Klopps Cemetery on the border of Lebanon and Berks County. It was well worth the drive to see the fascinating and beautiful old headstones, many of which you will be seeing as I get a chance to blog about them. Even though it was close to freezing, I could not get back into the car! I had to see the next headstone! As I come across interesting obituaries, I try to add them and tell the story of the person. I’ve been rather lax in this effort recently. I am transcribing journals from my family. I have started with my father’s memoirs and will add my grandmother’s, and great-grandfather’s, and great-great-grandmother’s. These are my gift to my family. You now know, aging but ageless, Linda in a nutshell.